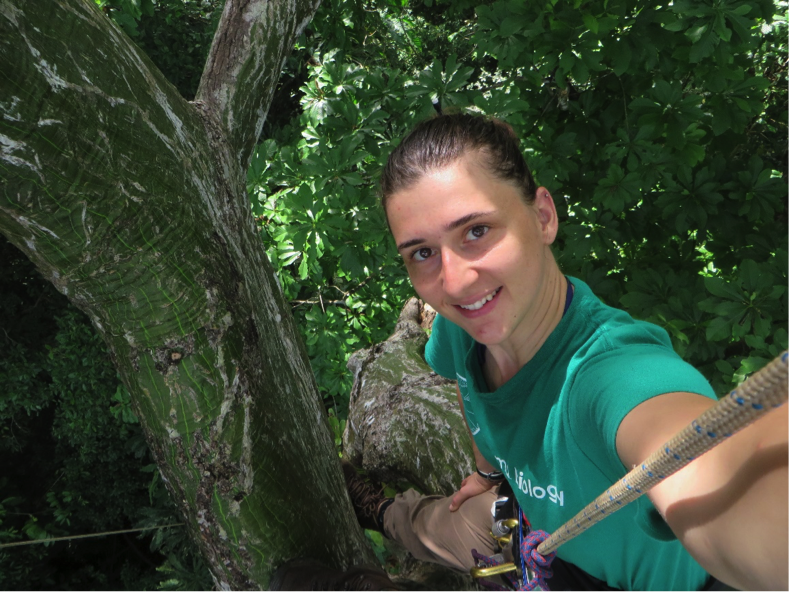 The author, Jelena Bujan, in the canopy of Pseudobombax septenatum, a deciduous tree with smooth green bark. Jelena is completing her third field season on Barro Colorado Island, in Panama. In tropical forests, is frequently assumed that canopies are “deserts” in terms of their microclimate conditions when compared to the leaf litter far below. If indeed they are extremely hot and dry then animals living in the canopies must require a special suite of adaptations. But the truth is we don’t know to which extent tropical canopies and understory diverge in their microclimates. Temperature and relative humidity (RH) data measured across BCI’s canopy tower provide air measurements in a close proximity to the canopy. And while these data are incredibly valuable, they don’t capture the microclimates experienced by ants crawling on the canopy’s leaves and branches. Ants, only a couple of millimeters high, experience quite different environmental conditions from those measured by weather stations. To handle high temperature and low humidity they need to adapt. Desiccation resistance arises through a suite of mechanisms which may be variously costly, trading off against other aspects of organismal performance. My study focuses on desiccation resistance and the tradeoffs that ants potentially experience regarding regulation of water loss, thus tolerating low humidity levels, and their critical thermal maximum (CTmax) – two traits necessary for surviving hot and dry environments. 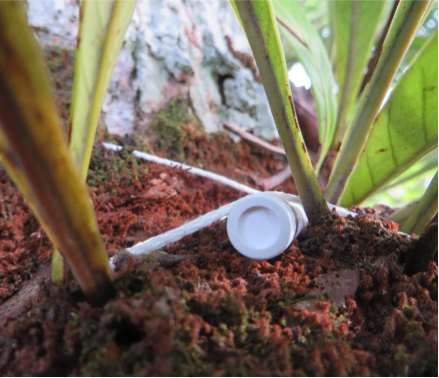 I am testing these ideas this in a community of tropical ants experiencing two microclimates—the tropical canopy and the understory of Barro Colorado Island (BCI). First I needed to quantify the differences in microclimates of different habitats. 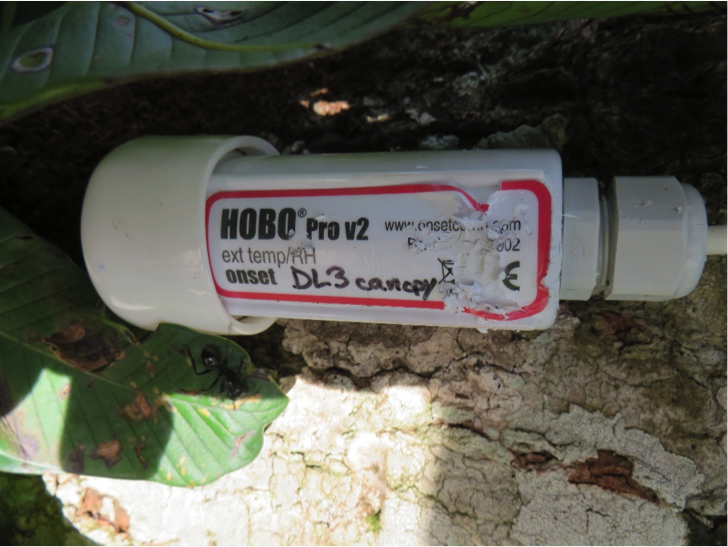 This field season I placed data loggers in the canopies of 5 different tree species on BCI. Since I was trying to capture as many microhabitat variations as possible, I placed them above and below the branch, in the epiphytes, in the leaf litter, on lianas etc. To see how temperature and humidity changes in correlation with the surface distance I stacked them up. Data logger probes in different canopy microhabitats, and at different heights. Cephalotes atratus is here for scale. The loggers are recording temperature and relative humidity (RH) every 10 min. After finding the loggers that will tolerate high humidity and deploying them, it turns out they are also interesting monkey toys. But they are also quite durable – so far they all still work (knock on wood). And yes, we are finding that the canopy is hotter, and more variable in terms of both temperature and RH, but the desert comparison seem to be exaggerated. Still, compared to the tropical litter is saturated with water, I predict that an RH under 60% found regularly in the tropical canopy should still be stressful to its ants. One way to avoid this stress is to be desiccation resistant. To test ant desiccation resistance, we are first measuring how long ant workers from different habitats can survive in a 0% humidity air. Then, to see to which extent ants are regulating their water loss, we are exposing live and dead workers to 0% humidity, and measured their water loss over the same time interval. I expect to find no difference in water loss between live and dead ants from the understory (that is, understory ants don’t actively regulate water loss), because they do not need to invest in water regulation since they are living in 100% RH. 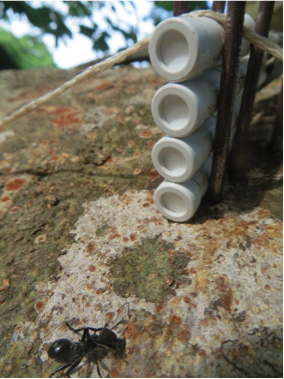 Canopy ants, in turn, should actively regulate water loss. As of the time of this blog entry, I’m finishing the last runs of these experiments, and the data entry awaits….